TOKYO, Japan, August 19, 2015 (ENS) – Mount Sakurajima is about to erupt again, the Japan Meteorological Agency warns. 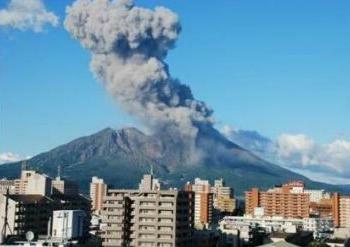 The volcano is located 50 kilometers (30 miles) from the newly restarted Sendai Nuclear Power Plant. Residents within three kilometers (two miles) of the volcano have been told to prepare for evacuation. The Meteorological Agency is maintaining the eruption alert level for the volcano of four on a five-point scale. Mount Sakurajima is in Kagoshima Bay, at the southern tip of Japan’s southernmost large island, Kyushu, about 1,100 kilometers south and west of Tokyo. The Nuclear Regulation Authority said Monday that the Sakurajima volcano is not a threat to the Sendai nuclear plant, which began generating electricity on August 14. It is the first of Japan’s nuclear power plants to restart under new safety rules established after the March 2011 earthquake and tsunami that caused a meltdown at the Fukushima Daiichi nuclear power plant. Kyushu Electric Power Co., which operates the Sendai nuclear facility, said Monday that operations were normal, although not yet at full power. The nuclear power plant is expected to undergo a performance verification and return to the normal operation at the beginning of September. But Greenpeace Japan anti-nuclear activists are not convinced that the Sendai power plant is safe. “Our analysis has shown that even without lava reaching the plant, volcanic ash from a larger eruption could cause a major nuclear disaster at the site,” he said. The volcanic risk assessment submitted by Kyushu and accepted by the nuclear regulators is “deeply flawed” and does not comply with the International Atomic Energy Agency’s international standards, Sekiguchi warned. “Prime Minister [Shinzo] Abe touts the NRA standards as the strictest in the world, but in reality the agency has approved restart of Sendai reactors despite significant outstanding safety issues, including seismic and volcanic issues,” he said. Greenpeace believes that the restart of the Sendai nuclear reactor will not reverse the terminal decline of Japan’s nuclear industry, given all nine Japanese nuclear utilities are faced with insurmountable safety issues at their nuclear power plants together with mounting political, public and legal challenges. Japan’s 43 remaining nuclear reactors have multiple safety issues, including seismic faults located at reactor sites and age-related problems, which together with public opposition are likely to force many reactors to be permanently shut down, said Greenpeace Japan in an analysis released in April. On the horizon is the 2016 liberalization of the country’s electricity market, which will expose large nuclear utilities to competition, including from Japan’s quickly expanding renewable energy industry.